After our productive morning (Part One) that included a hike to Pfeiffer Falls, Sarah, James, Jarrett and I headed back to camp where we found Paul and Lisa, who had just arrived moments earlier. Their arrival was extra exciting because Paul told me where Sarah and I had failed to get through to the hot springs reservation line, he had succeeded! I was ecstatic, and everyone else was an appropriate amount of excited. 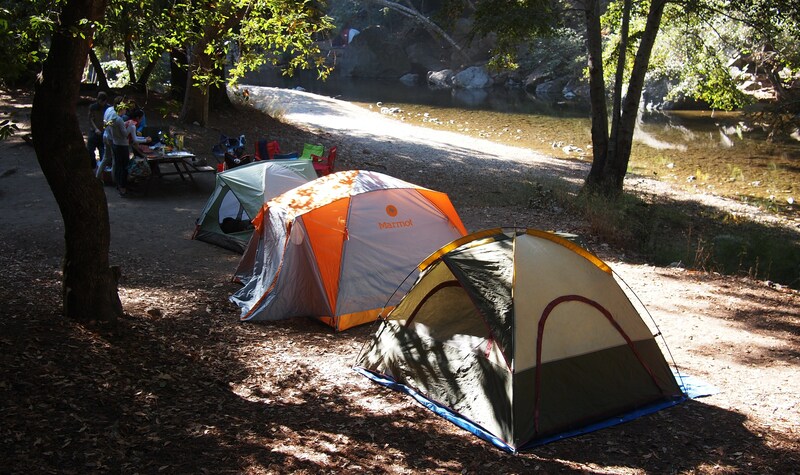 While helping P&L set up, we enjoyed the classic PB&J for lunch and were able to really take-in and enjoy our awesome campsite, which was situated right on the Big Sur River. Overall the campgrounds were pretty crowded, with sites pretty close to each other, but we were lucky and had booked one of the larger sites right next to an opening to the river bank. We spent some quality time enjoying the river and skipping stones. 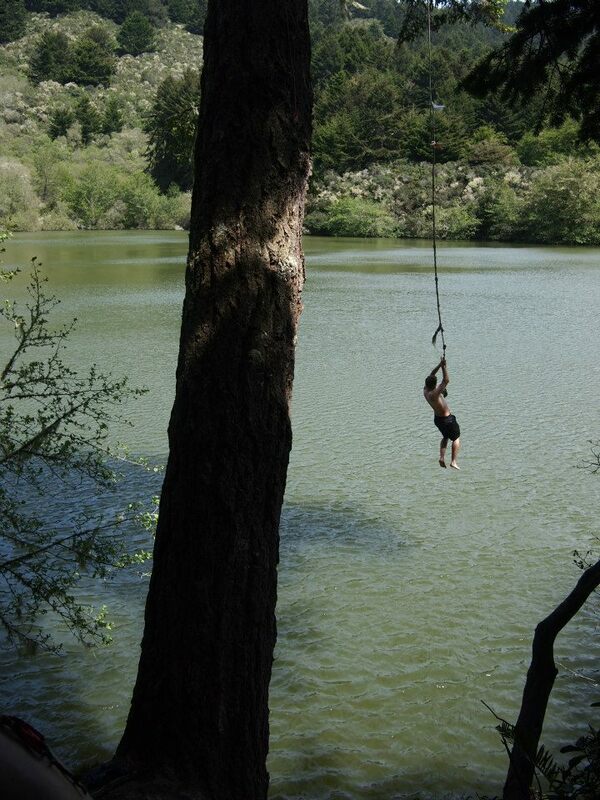 Fact: James is a stone skipping artiste — I think I counted seven skips in one throw. Our afternoon hike took us about twenty minutes south on Highway 1 to Julia Pfeiffer Burns State Park where we couldn’t stop taking photos the second we stepped foot out of the car. Seriously!? This actually exists in California! In which I embarrass my friends again by blocking off the entire walkway for another awkward group photo — yay! 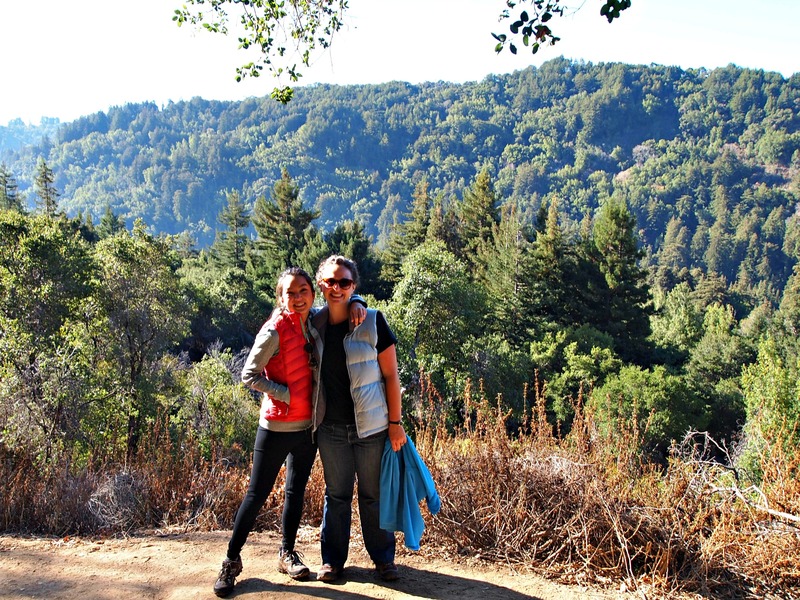 After admiring the coastline and the falls for quite some time, we started our actual hike onto the Ewoldsen Trail, a 4.5 mile loop that is known as the quintessential Big Sur hike. Unfortunately because of some landscaping and trail upkeep, half of the trail was closed of, but we were able to take the western half of the loop all the way up to the lookout point. 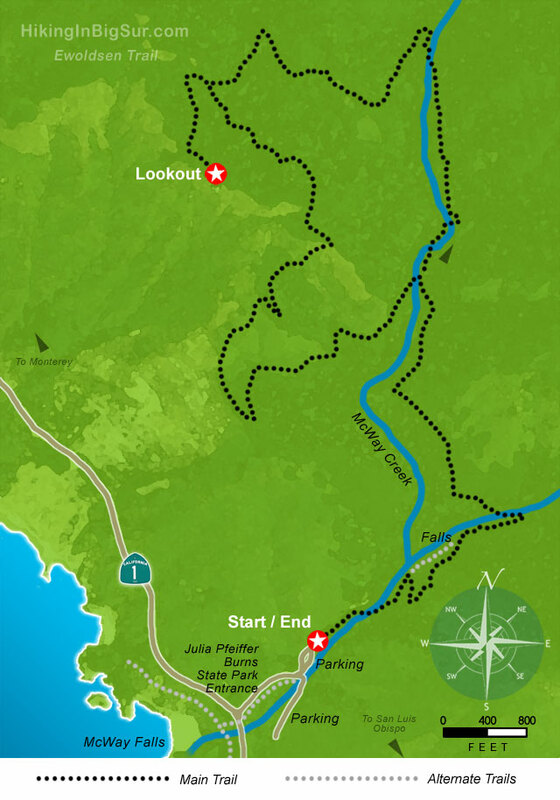 Here’s a brief map of the trail — it’s only a 4.5 mile loop, but it was extra challenging because of the route we took. Because the eastern portion of the loop was closed, we did an out-and-back pathway on the western potion of the loop, which was a very steep uphill climb. Hiking up to the lookout point was pretty strenuous, and we ended up taking quite a few breaks along the way, but it was all worth it. The journey is documented below. 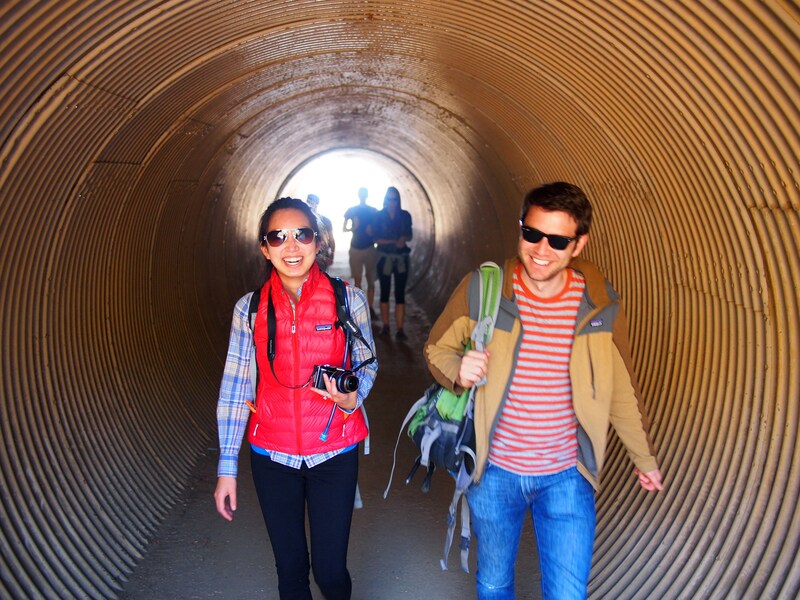 A random tunnel that facilitated the production of some great monkey sounds. Holy shrimp, we actually made it — phew! Check out that amazing view! It seriously felt like we were on top of the world after the crazy hike. The fog rolling in below also contributed to that effect. 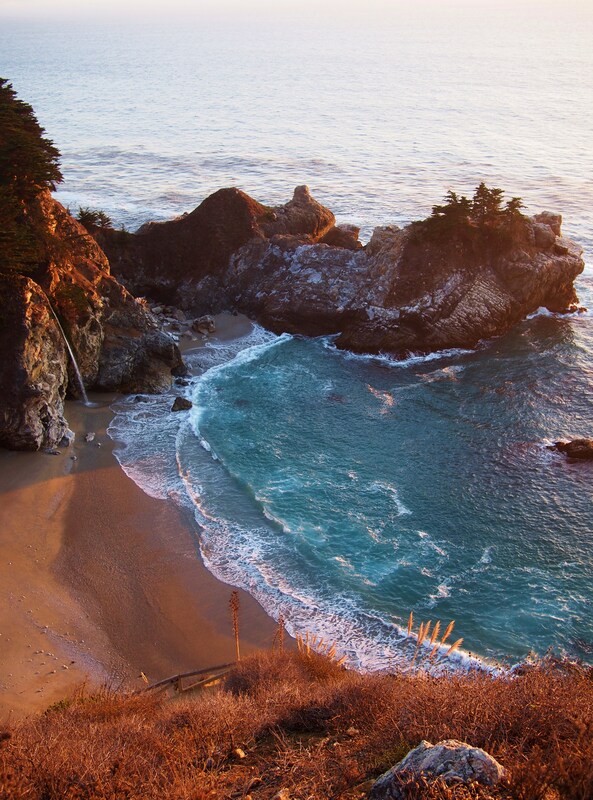 This is sunset at McWay Falls, one of the three waterfalls in the US that empty into the ocean (the other two being Alamere Falls, which we’ve hiked to, and Waiulili Falls in Hawaii). The beach area you see to the left used to not exist — the entire inlet was filled with water, and the falls emptied directly into the ocean. However, a large landslide and resulting highway reconstruction project in 1984-1984 filled the little cove with enough sand to create the beach you see pictured. With that last shot, the hiking portion of our trip came to a close. We were seriously exhausted as we headed back to camp, but we still had a significant part of the trip left — the hot springs! Back at camp, we had leftover quesadillas and Sarah’s homemade lentil soup, which was fantastic. Camp was seriously cold; our area was tucked away under the cover of trees and foliage, so it never really warmed up during the day. 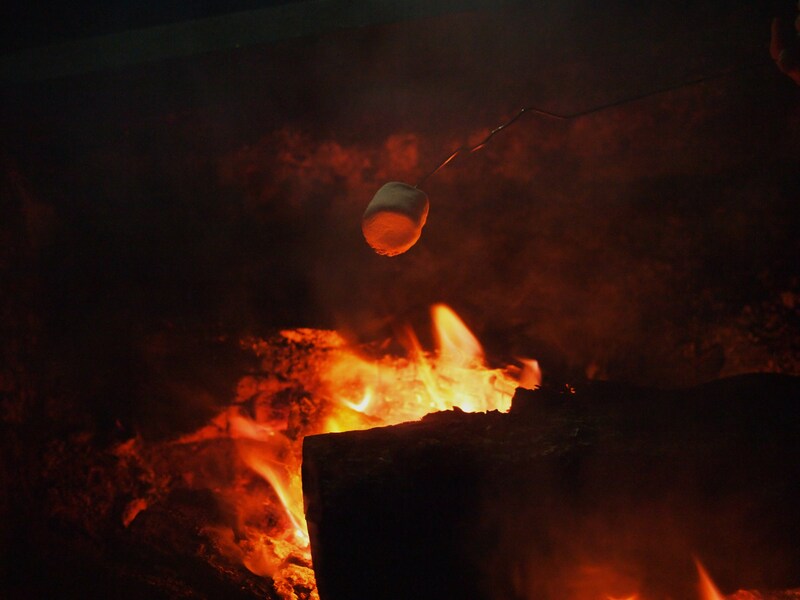 We set up our campfire to stay warm, and then, of course, we s’more’d! So, instead of telling scary campfire stories, we decided to reveal our most embarrassing and hilarious childhood moments. 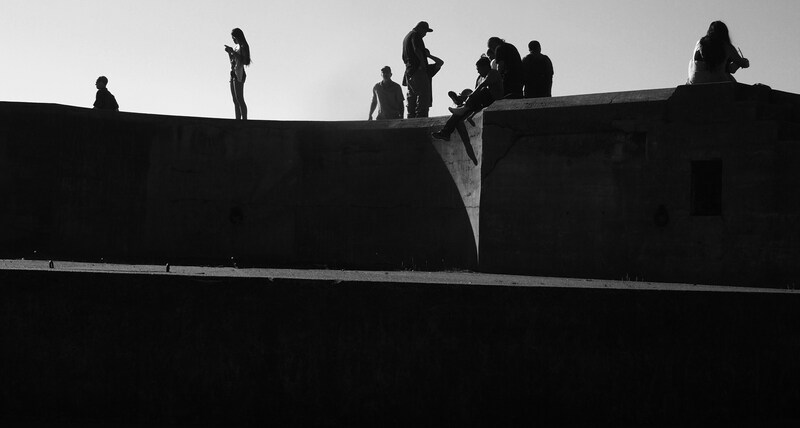 I’ve known this gang for so long, but some of these tales were news to me. I’m still cracking up when I think about them. We were killing time around the fire, waiting for the most anticipated part of the trip — the hot springs. As I mentioned earlier, Paul had managed to get through the busy phone lines that morning to make a reservation for our group at Esalen Natural Hot Springs. 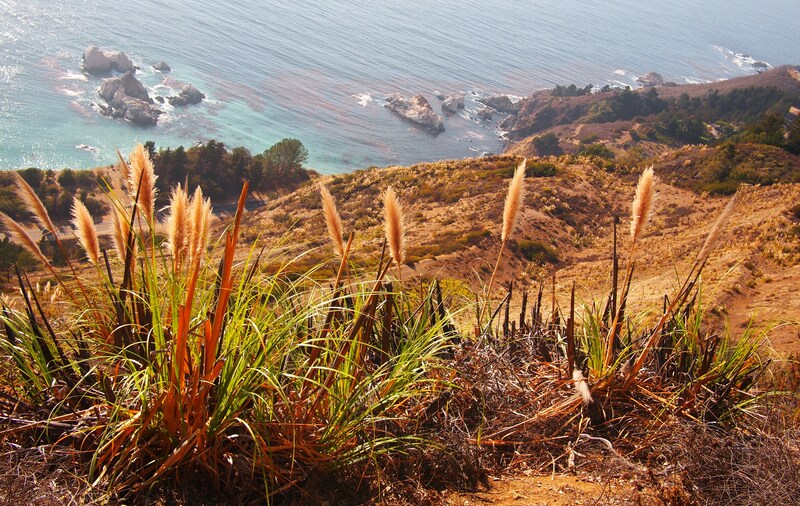 The Esalen Institute is a beautiful retreat situated on the rugged Big Sur coastline that boasts natural hot springs. The hot springs are only open to the public from 1 am – 3 am, and during the off-season, you can only make same-day reservations. They also only accept about 20 people per night. Needless to say, we were extremely lucky to have snagged reservations. After a short nap at the campsite, we woke up at midnight to sleepily make our way down the coast to the Institute. I won’t say too much about the springs except that the entire experience was magical. Seriously, if you are lucky enough to have the opportunity, you should have an experience at Esalen. Our tub was located right on the cliff side, so looking over the edge of the rocky basin, we could see and hear waves crashing onto the rocky coastline. It was surreal and magical to be in submerged the sulfuric water in the middle of the night under the clouds and on the coast with some of my closest friends. The experience was amazing and one that I will not soon forget. On our way home on Sunday we stopped in front of Bixby Bridge, which is one of the tallest, single-span, concrete bridges in the world and the most photographed on the Pacific Coast (thanks, Wiki). 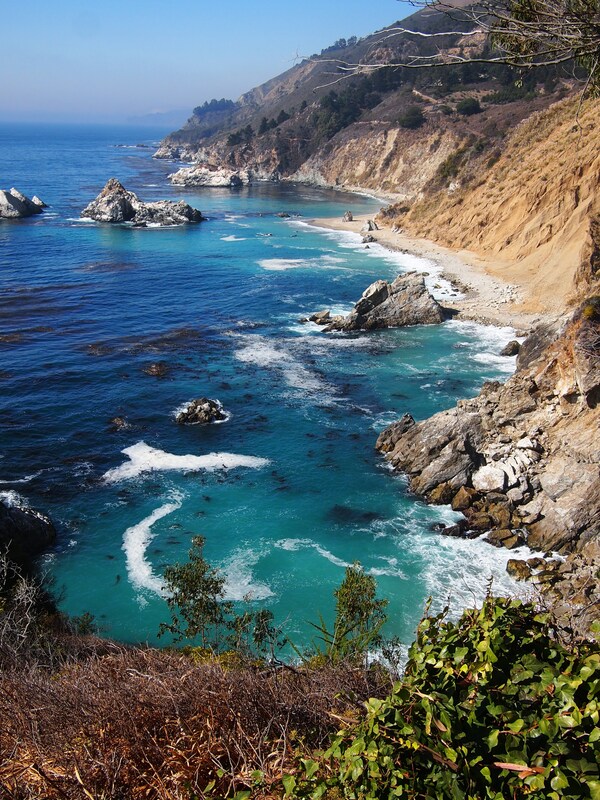 And with that, I complete the long overdue, two-part Big Sur update. Happy holidays! 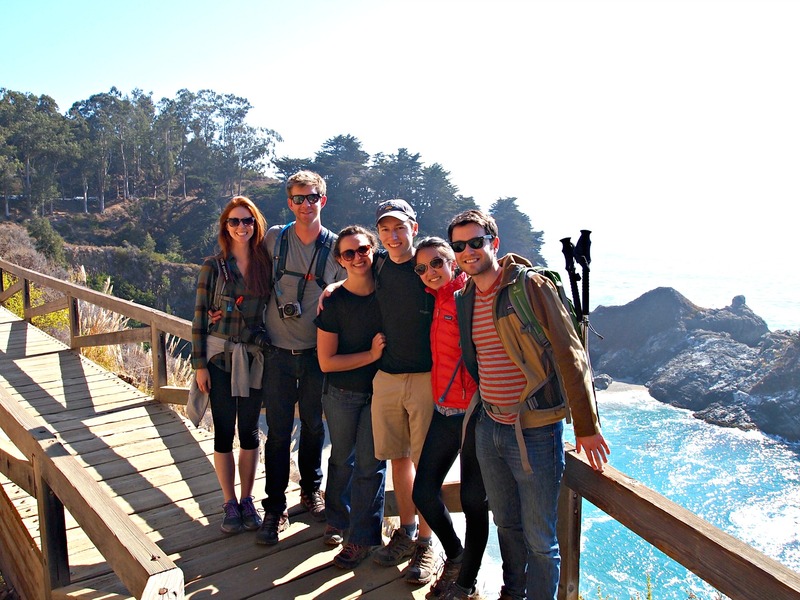 Now that I’ve put away the last of my camping gear and finally transitioned from old job to new, I can write about our awesome trip to Big Sur in October! Yes, it took me 1.5 months to finally put away the last camping item — a sleeping pad that had found a temporary home in my living room, not wanting to return to the depths of my storage unit. For full disclosure, the past 1.5 months have been incredibly busy: I was working full time while interviewing and job searching, Thanksgiving was on the timeline, Mitch (my future wedded partner and best friend) returned from a nine month deployment (see some awesome photos by the talented Katie Yuen here), and I adopted a rescue bunny from this amazing organization. 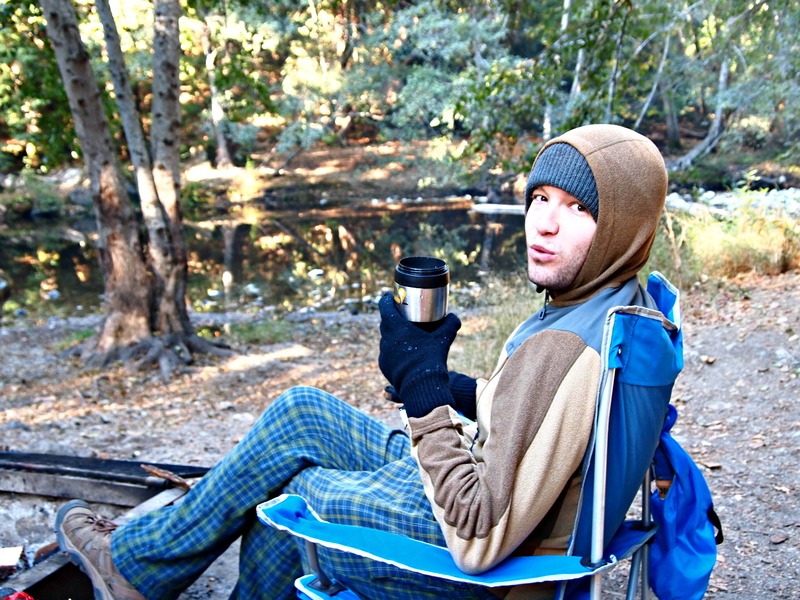 Anyway, that is my list of mostly reasonable excuses, but without further ado: BIG SUR CAMPING! Camping and I go way back. My adventurous dad instilled in me a love for nature and sleeping in tents, taking my sister and me every summer ever since I can remember. We’ve been to so many national parks, we’ve hiked a seemingly endless number of trail stairs, popped a squat on the most precarious of mountain ledges, seen the most beautifully clear, placid bodies of water (B.O.W.! 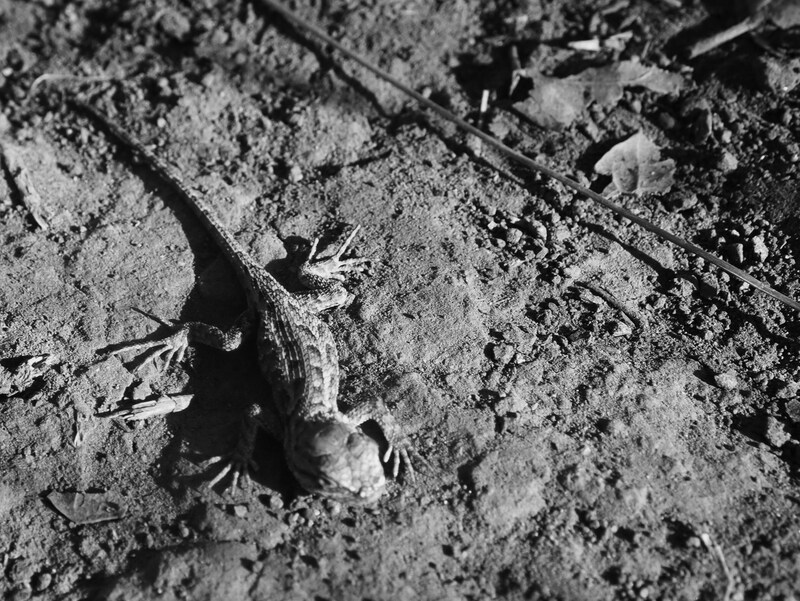 ), and gotten eaten alive by mosquitoes (they love me) countless times. Despite the ravenous bloodsuckers and the difficulties of nature calling in nature, all of these adventures opened my heart to the awesomeness of the great outdoors that I continue to enjoy with Hiking Club all the time! Thanks, Dad! The first group (Jarrett, Sarah, James, and I) arrived to our campsite at Fernwood on Friday evening after sunset. Using our $2.67 headlamps (thanks, Costco), we enjoyed a dinner of quesadillas and set up camp pretty easily despite the darkness. We were pretty bushed (nature pun!!) 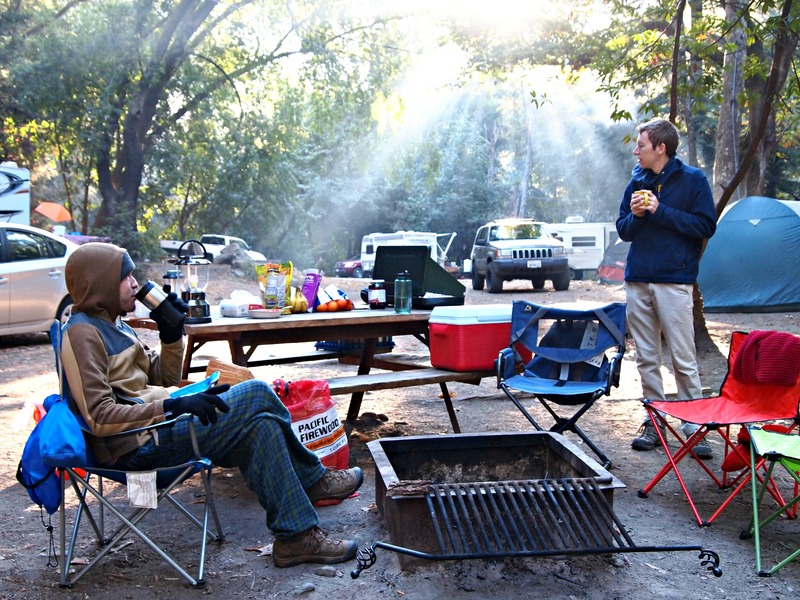 from the work week, so we kept it pretty low-key that night around the fire and got to bed pretty early. Oh, and despite all my crazy lists and prep-work and countless email reminders to the crew, I forgot my pillow — classic. 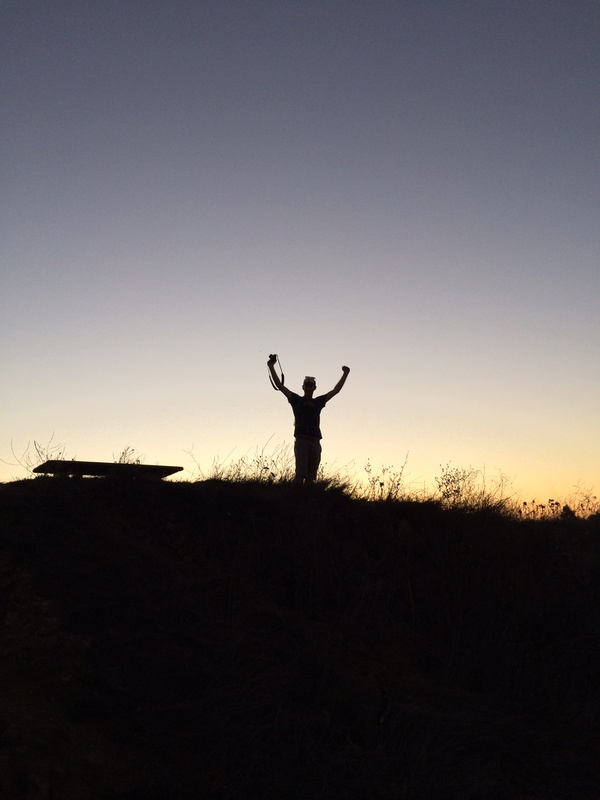 I was roughing it… with my down sleeping bag, sleeping pad, cozy tent, and iPhone. No pillow means roughing it, right? The next morning, I woke up pretty early because we were trying to snag some very coveted hot springs reservations for that night. After over 100 phone calls, Sarah and I got a message saying they were all booked up. I was pretty bummed, but Jarrett and James were great at keeping my spirits up. For breakfast, Sarah prepared her homemade instant oatmeal (she is awesome) for the crew. She is like the Martha Stewart of the great outdoors, minus the insider trading. 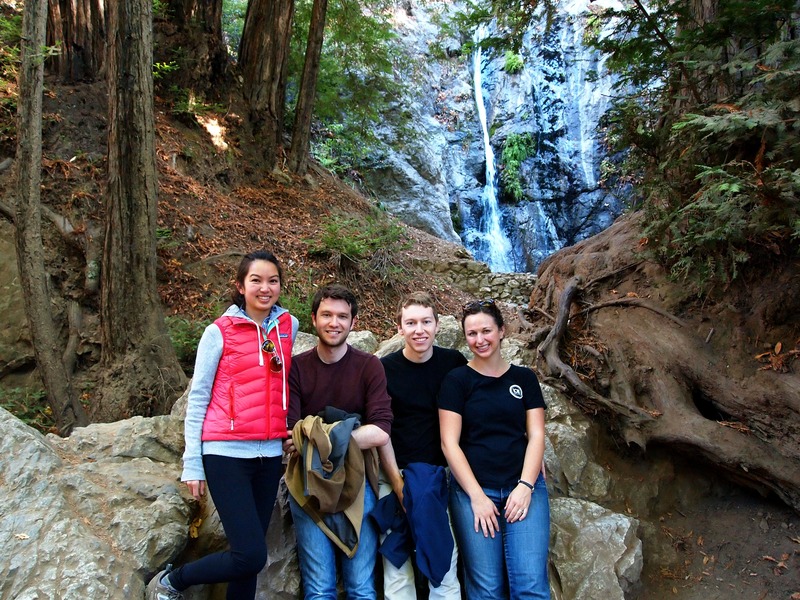 After breakfast, we headed one mile south for a quick, three-mile hike to Pfeiffer Falls and Valley View. Since this post is already becoming quite long, I’ll just link you to a good trail description here. Breakfast at camp with some magical sunbeams. Oh, did I mention that Jarrett moonlights as an ewok? Sarah and me on our way up to the falls! Do not underestimate me: I won’t hesitate to embarrass everyone by forcing them to pose for an awkward group shot taken by a stranger. No regrets. 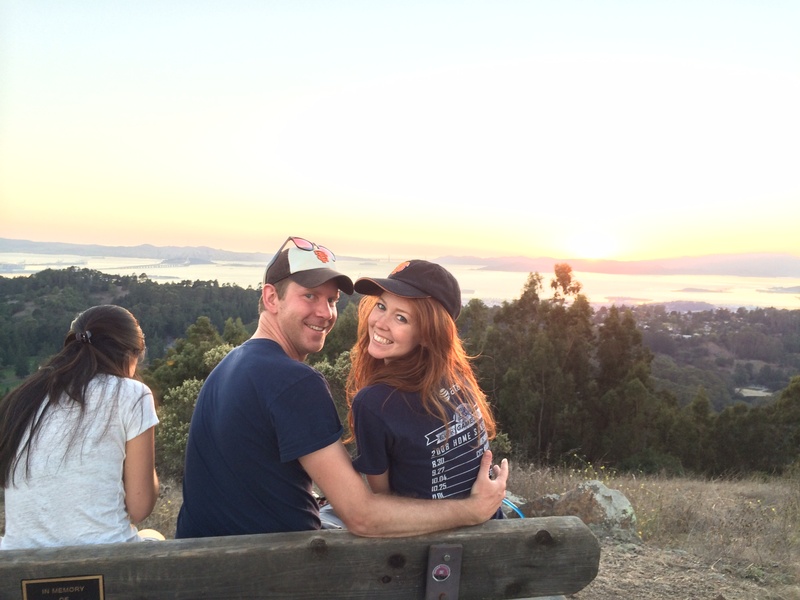 Sarah and James enjoy the valley view. Overall, the hike was short (three miles) yet challenging at some parts. The points of interest were a bit underwhelming, but it was a great way to get active early in the morning and productively use our time before Paul and Lisa arrived. Part Two of our day is up next! 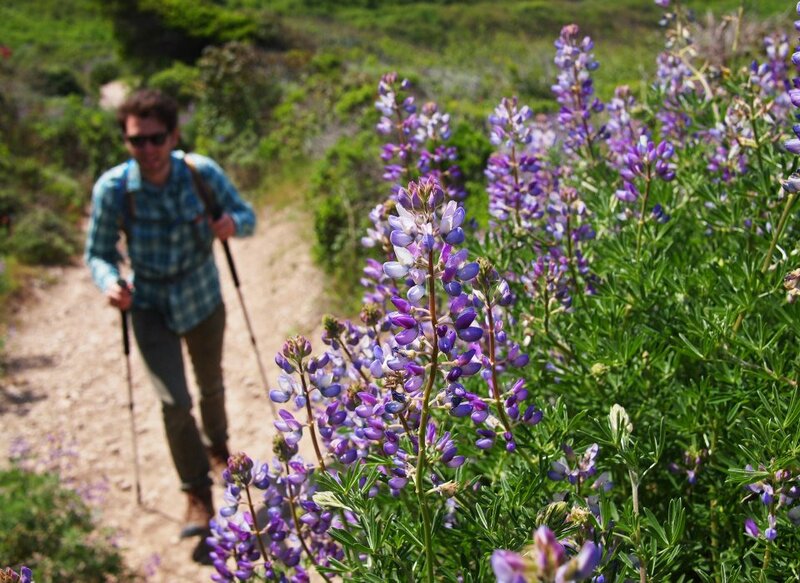 Best Season: Spring and Fall for good, clear views and less crowded trails. Summer is fine too, but the views may be obscured by fog, and there will likely be more hiking traffic as well. Hi, friends! This weekend really feels like the beginning of Fall. After our Indian Summer here in the Bay, things have started to cool down just a bit. 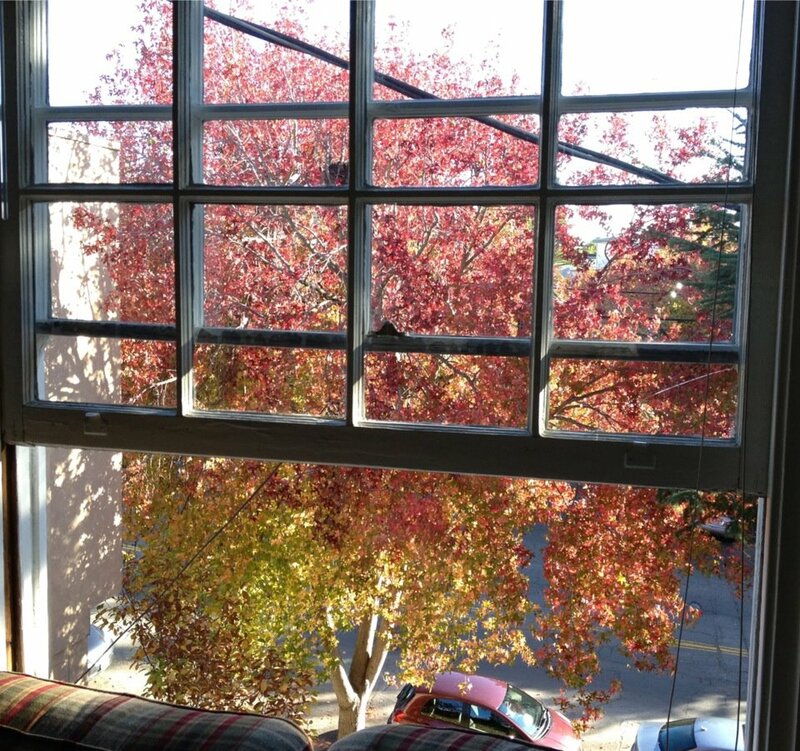 Sitting in my big, green chair in my living room, I can see the leaves of “my” giant oak tree beginning their colorful transformation. It’s comfortable outside, but there’s a deliberate breeze that adds a definite crispness to the air. It’s perfect tea-drinking, sweater-wearing, scarf-knitting, puzzling, blogging weather. If there was any question about my grandma-status, it should now be answered. I love being able to see this big oak tree right outside my window. This weekend, Hiking Club is taking a hiatus because of our busy schedules, so I’m taking this opportunity to catch up on all the hikes we completed before this little blog came into existence. Recently, I’ve been posting a lot about shorter hikes we’ve taken lately since we’ve been so busy, but when we first started regularly hiking, we were definitely taking on longer, more challenging, treks. 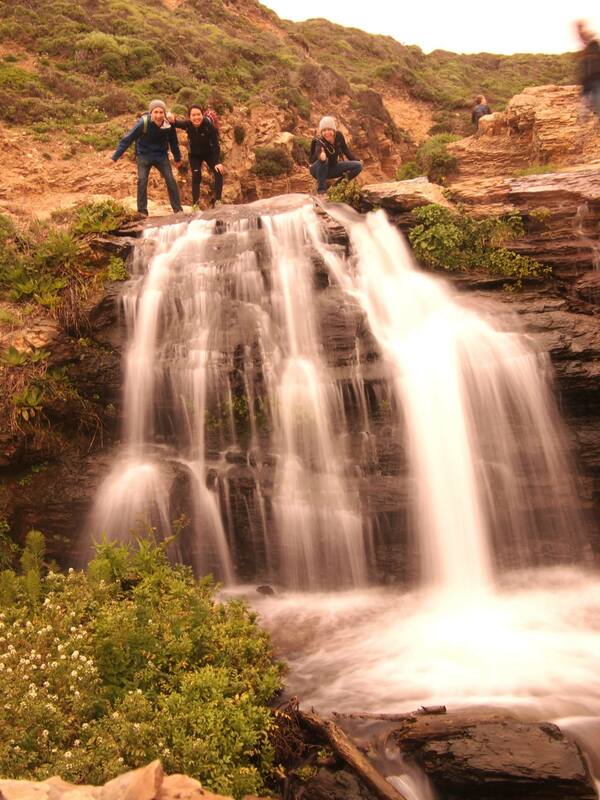 The first Hiking Club excursion took place quite a while ago on Saturday, March 8, 2013. 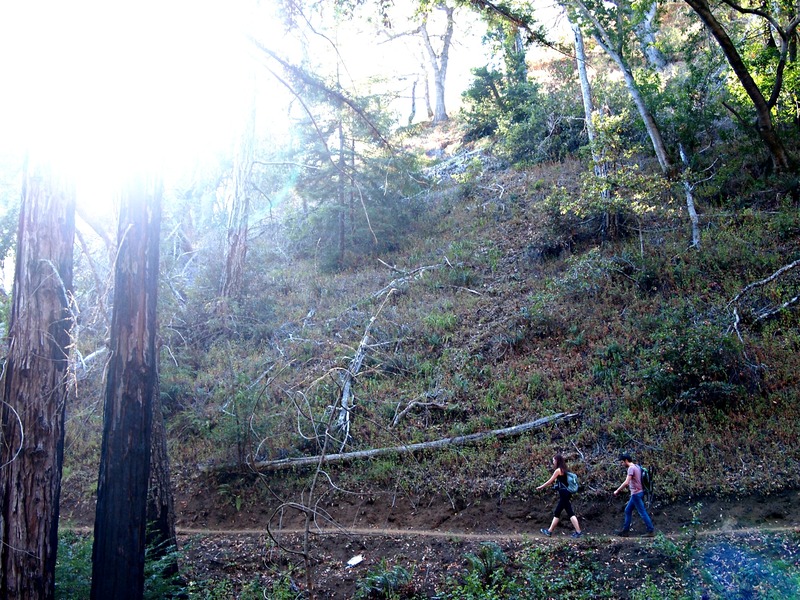 I suggested the Matt Davis – Steep Ravine Loop at the the recommendation of a coworker, and the results were fabulous and really set the tone and excitement for all hikes to come. This fabulous, 7 mile loop in Mt. 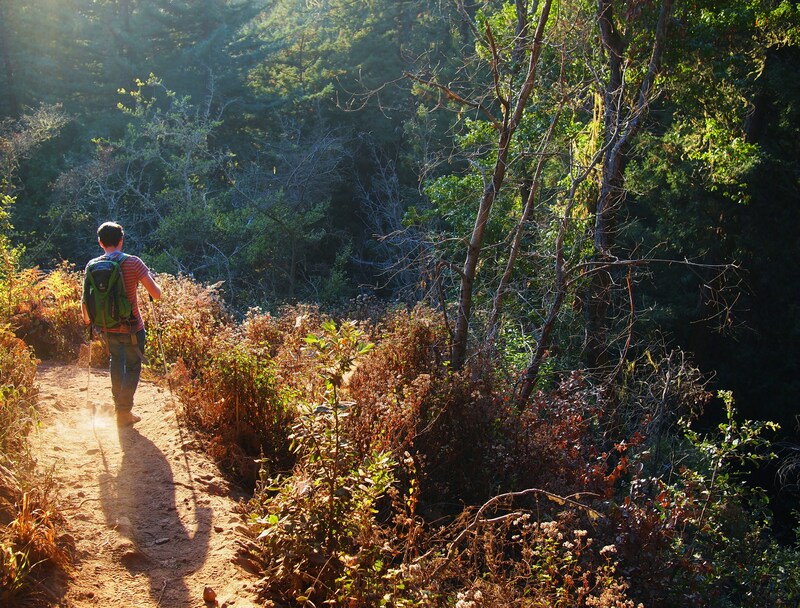 Tamalpais State Park begins in the little town of Stinson Beach and consists of the Matt Davis, Steep Ravine, and Dipsea Trails. 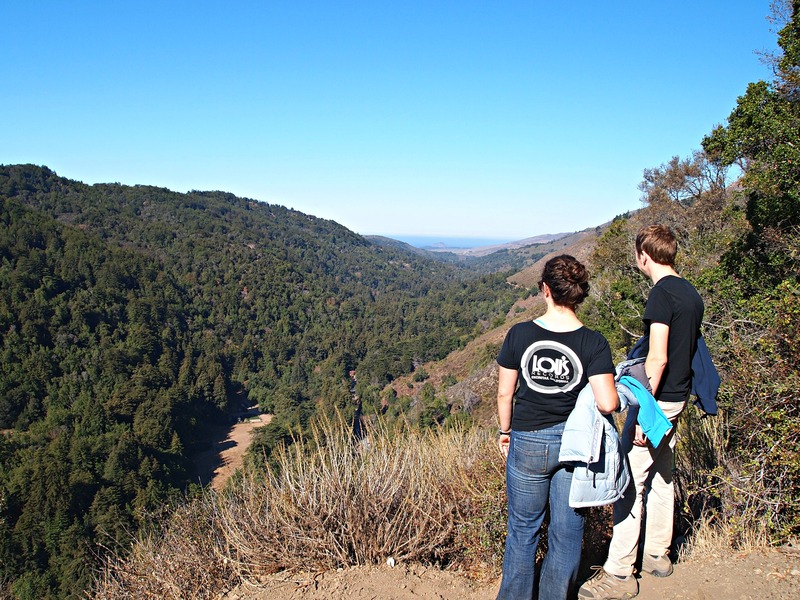 You’ll experience a wide variety of scenery, including waterfalls, creeks, bodies of water (Fact: I love bodies of water), rolling hills, forests and, on clear days, awesome views of San Francisco. 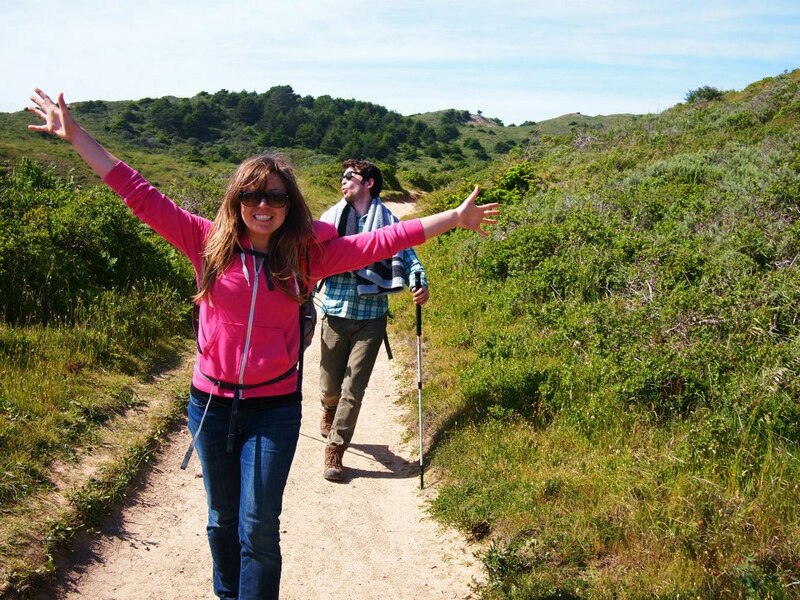 It remains one of our favorite hikes and really got everyone excited about making hiking a regular part of our lives. Trail Summary: 1. Begin on Belvedere Ave near Stinson Beach (close to the Stinson Beach fire station), starting on the Matt Davis Trail. Shortly thereafter, there’s an unsigned intersection where you’ll stay left to stay on Matt Davis. 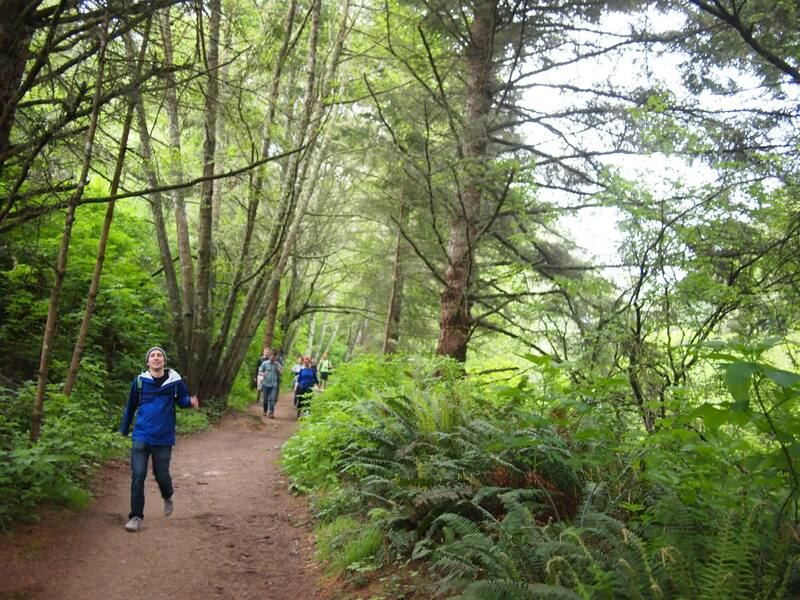 At 2.5 miles you’ll meet the Coastal Trail, but stay to the right and remain on Matt Davis. 2. After 1.7 more miles, you’ll reach a large intersection near a little parking lot. Cross the highway and the lot, and look for the Steep Ravine junction where you’ll continue on Steep Ravine. 3. 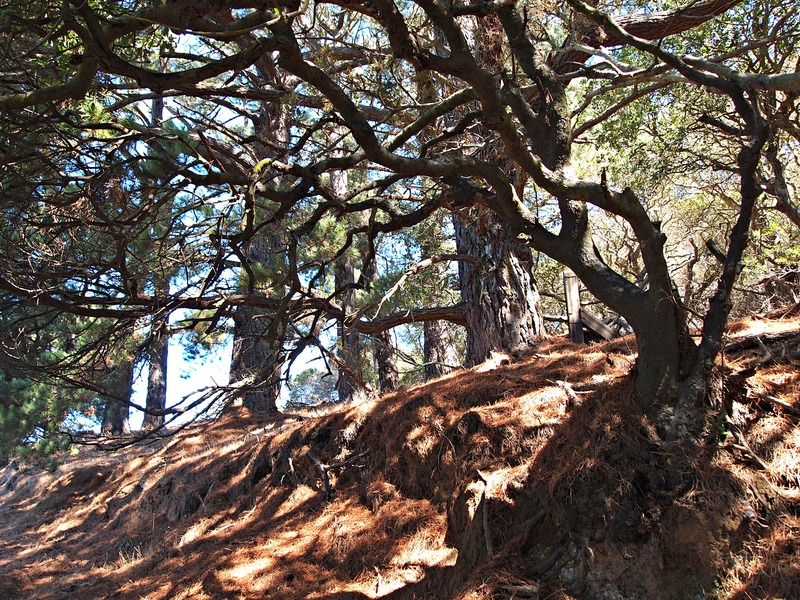 After another 1.8 miles, the Steep Ravine intersects with the Dipsea Trail twice (check out the close-up below). 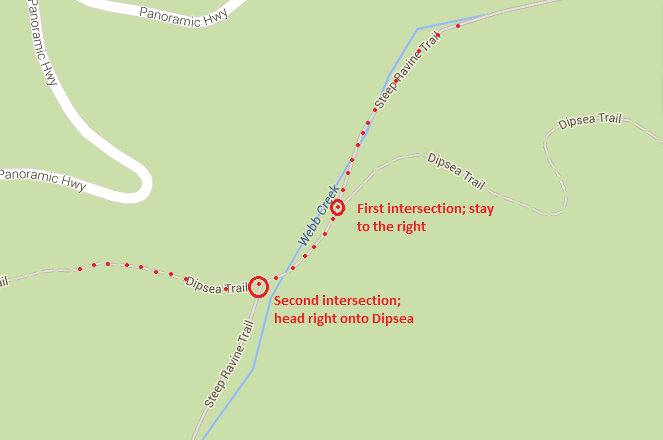 The first time, stay on Steep Ravine, then at the second intersection, head right onto Dipsea, which will take you for about another mile until it reconnects with the Panoramic Highway. 4. From there, you can head back to the trail head or wherever you parked the car. Close up of the double intersection from Steep Ravine to Dipsea. 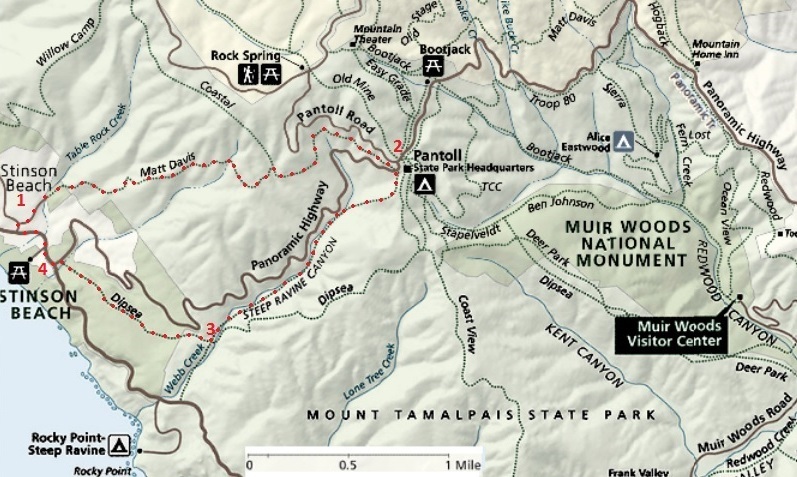 Matt Davis, master trail builder, worked on his segment of this loop in the 1920s after being commissioned to do so by the Tamalpais Conservation Club. We were honestly and pleasantly surprised by how varied it was — one moment, we were hiking through cool, moist (see side note below) forests alongside a creek with bridges and staircases, and the next we were in exposed grassland amongst rolling hills a la The Sound of Music. Side note: Am I allowed to use the word “moist” as a descriptor? I’ve had some strong reactions to it when used in the past. In fact, we discussed this during the hike, and I discovered most people have an aversion to the term. This discussion also brought to light our group’s particular word-aversions. Paul isn’t particularly fond of “serene,” and Lisa, “cyber,” so naturally, Jarrett and I peppered every sentence with as many instances of each word as I could. We are such great friends! To summarize, the hike was pretty fantastic with, as I mentioned, varied scenery and landscapes and offered a great workout. 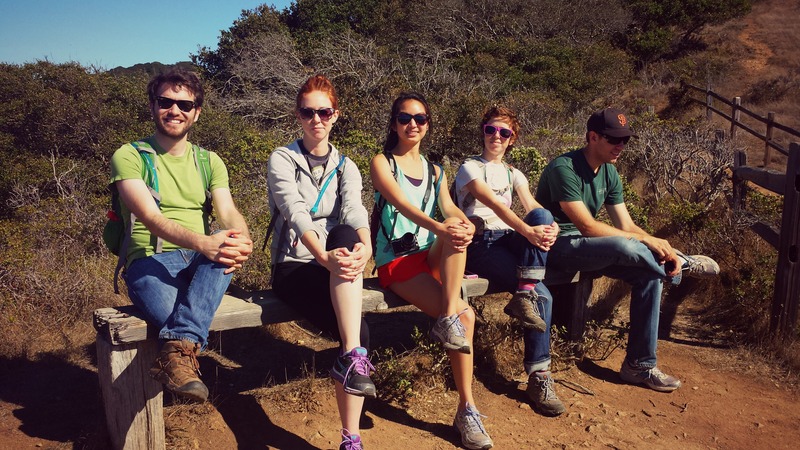 Because of this, I think we all became excited about making hiking a regular part of our weekend schedules, and Hiking Club, as we informally/affectionately call it, was born! 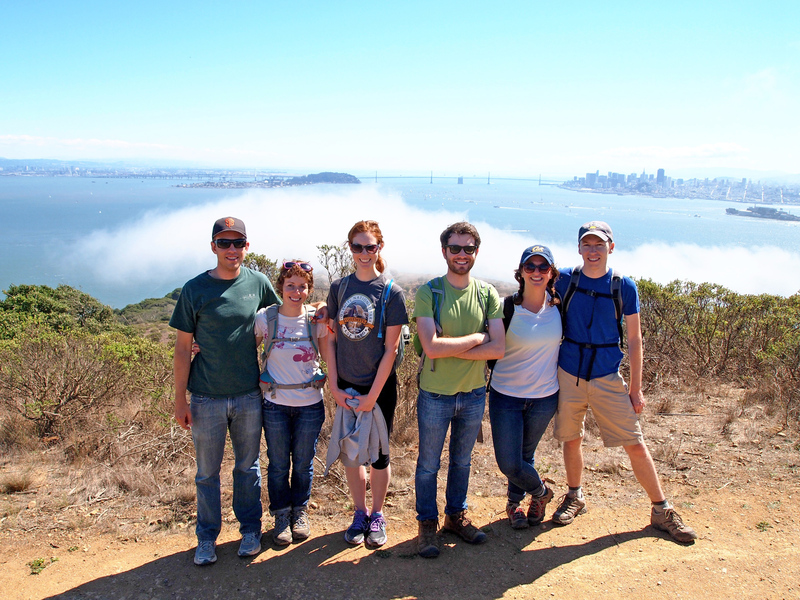 I wish I had more photos to share, but since this was the first Hiking Club excursion, there is a dearth of photos. I guess that just means we’ll get to hike it again. 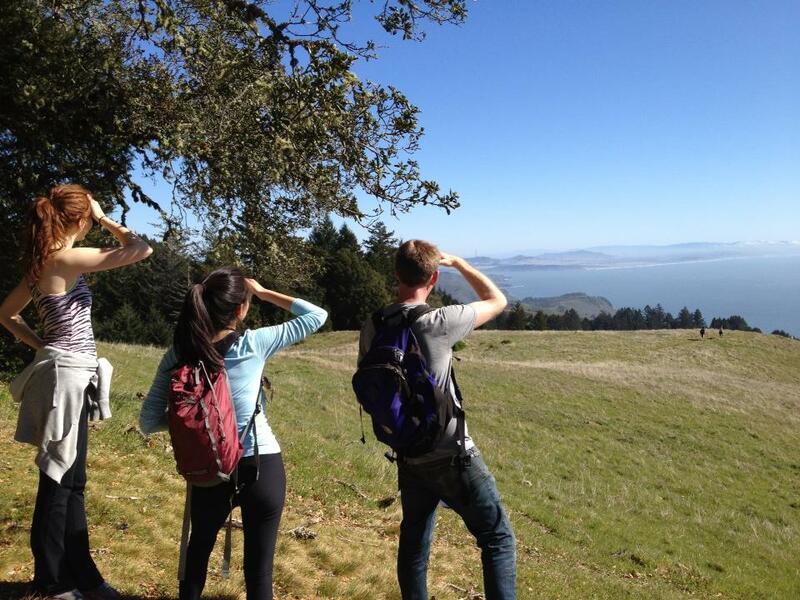 Jarrett snagged this seemingly posed but actually candid shot of Lisa, Paul, and me looking over the water at SF. 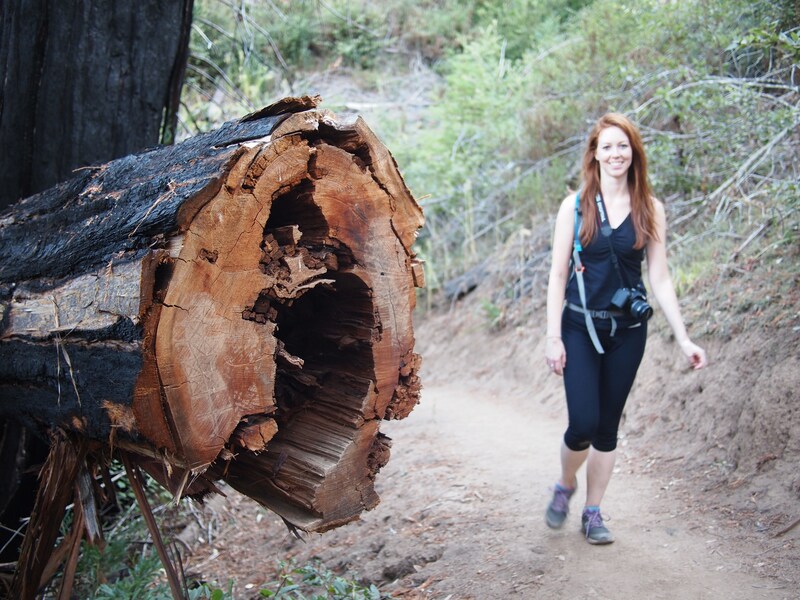 Alright, now sending this serene hiking post into cyber-space! 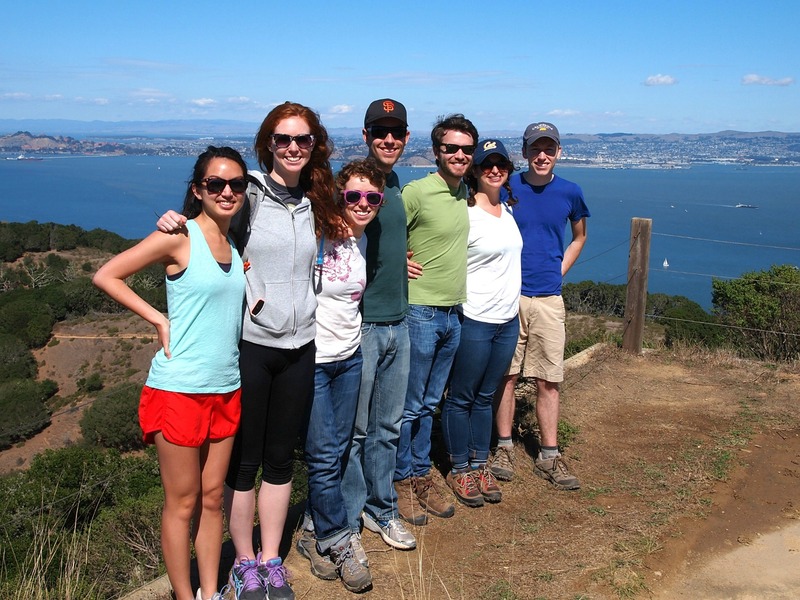 I’m sure you’ve heard the old Mark Twain saying, “The coldest winter I ever spent was a summer in San Francisco.” While it’s not true that Twain asserted this, the assertion remains true — Summers in San Francisco are notoriously cold, foggy, and dreary. Because of this, warm, sunny days that begin in September, draw everyone out into fresh air, which is what happened the day we hiked the Land’s End trail. 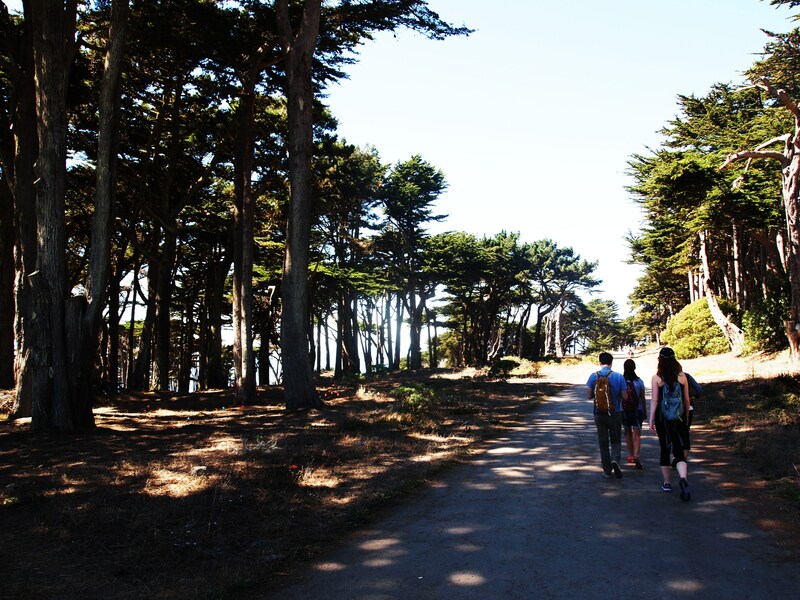 We’d originally planned for a quick, three-mile walk in the Presidio, but we ended up starting at Land’s End and hiking all the way down to Marshall Beach via the Batteries to Bluffs Trail. Starting at Land’s End near The Cliff House and China Beach, we headed north towards the GGB. The trails were well groomed and pretty packed with people and amazingly clear views of the bridge, even through the spokes of this bicycle. San Francisco was at its best, with all of our interesting, unique, beautiful people milling about, which made for great people watching! I couldn’t imagine living in a more unique, accepting, and wonderful place. 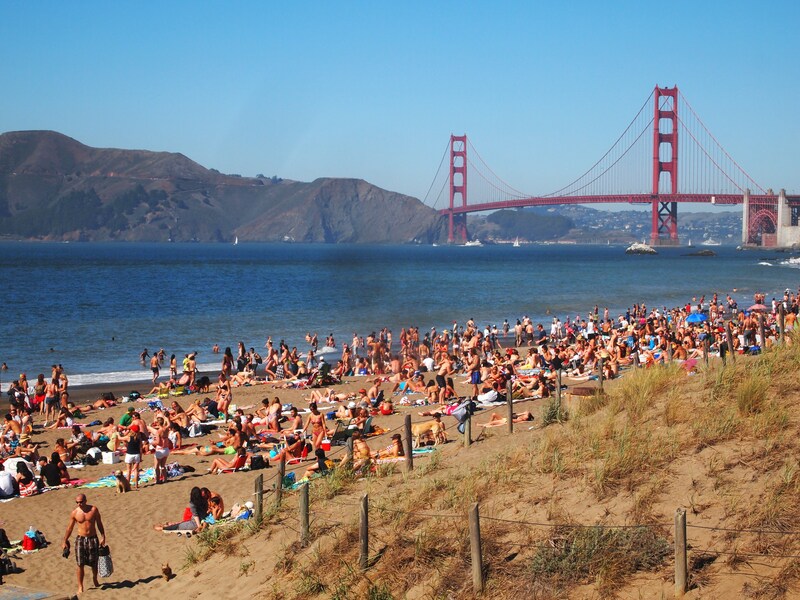 China Beach crowds really show up on warm days! 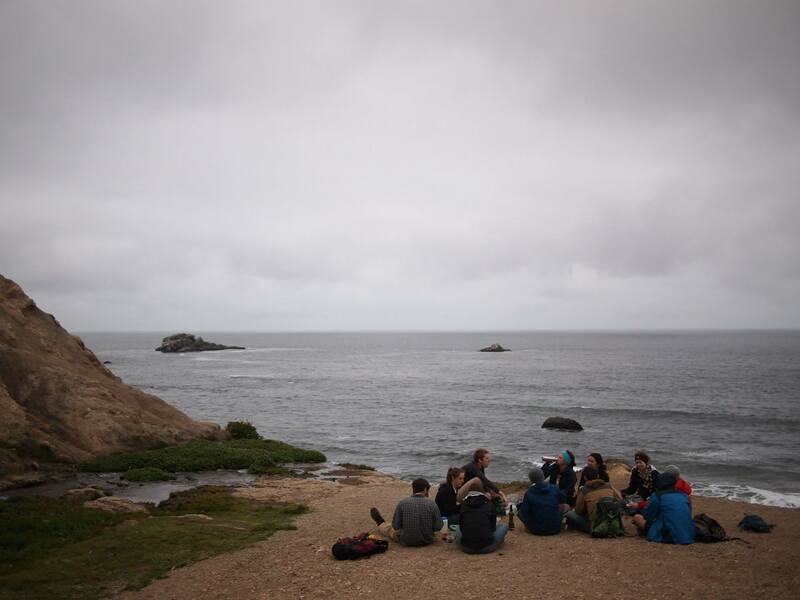 Land’s End is a loop, and we hiked through the upper portion, but instead of turning back to complete the loop via the lower portion, we stopped at China Beach for a quick snack of lemon bars and for people watching. 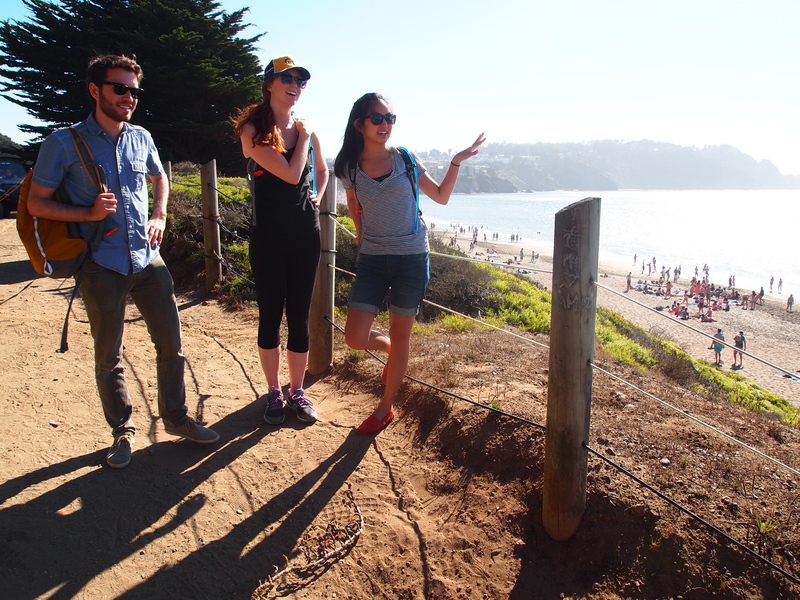 China Beach was, not surprisingly, packed with people that uncharacteristically warm day. 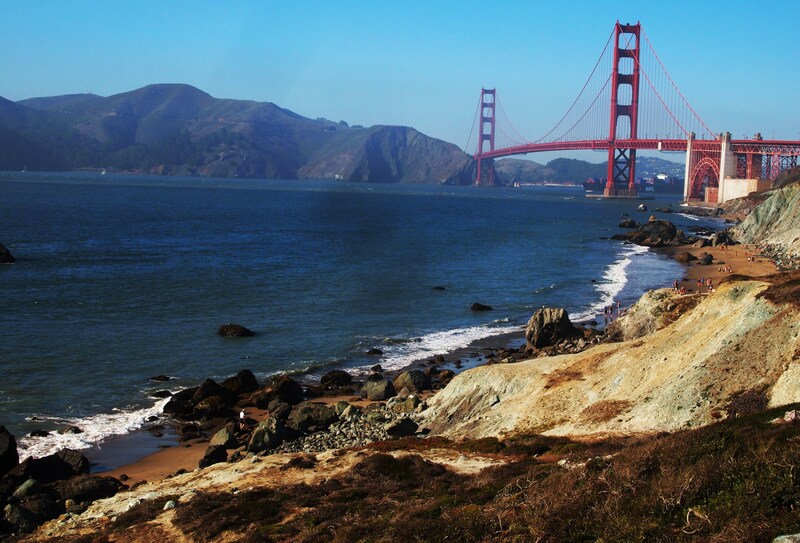 What an amazing beach view of that bridge, though, yes? From there, we left the Land’s End trail and walked through the San Francisco “suburbs” to connect with the Batteries to Bluffs trail. We passed Robin Williams’s abode, enjoyed the beautiful architecture, and I’m pretty sure I got my photo taken by someone’s security camera. There’s nothing like walking through palatial, security-ridden homes to really humble you; however, that only whetted our ambition. We all decided to someday buy houses here within walking distance of each other. Really. Seriously. Don’t believe us? Well, you’re probably right, but one can dream. 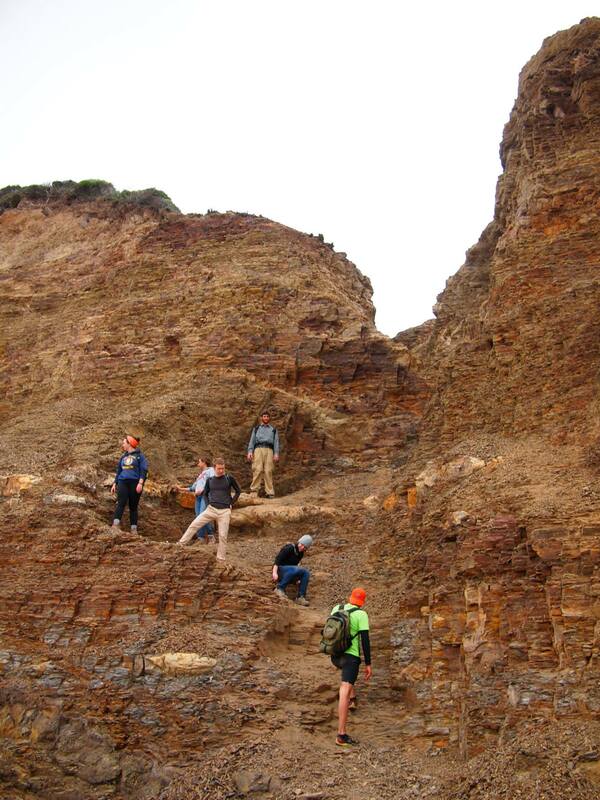 The Batteries to Bluffs trail begins along the San Francisco coast a little south of Baker Beach, continues past some artillery batteries, and provides breathtaking views of the Golden Gate Bridge along some really beautifully rocky sea cliffs. Check out this awesome shot Paul caught of one of the artillery batteries. 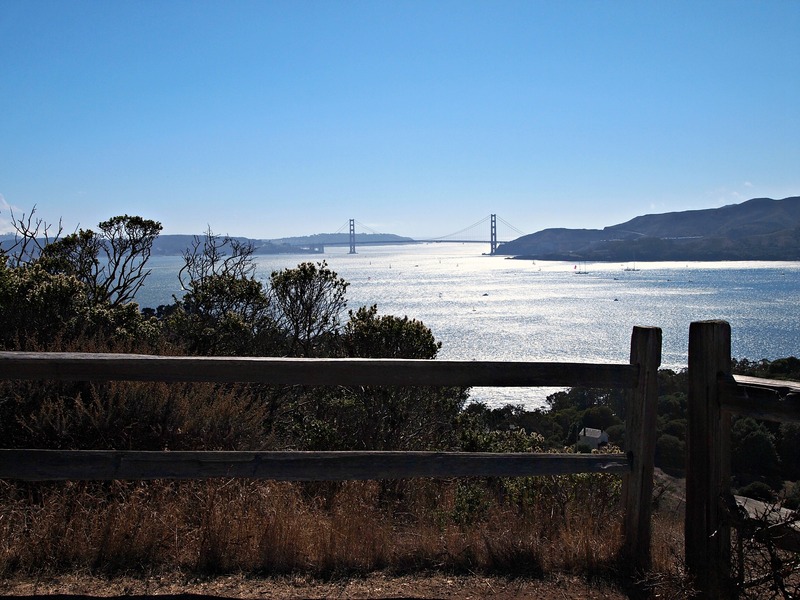 Breathtaking view of the bridge from Marshall Beach on the Batteries to Bluffs trail. 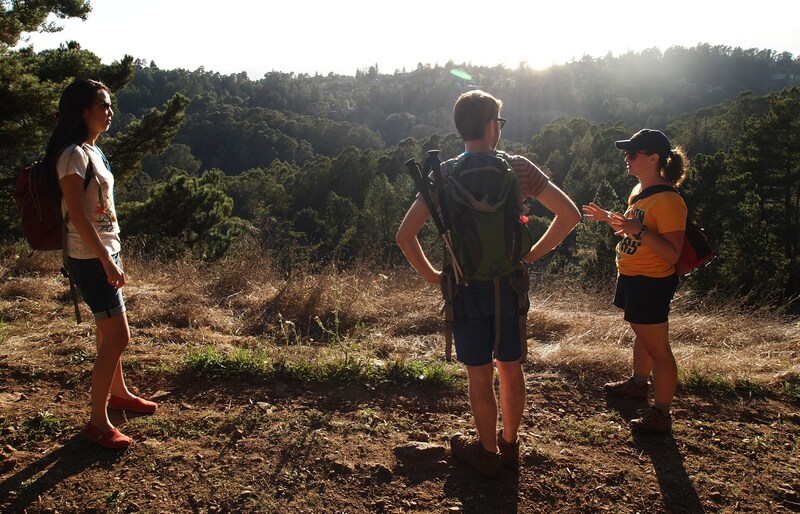 The trails here take you right onto the edge of serpentine cliffs where you’ll really feel part of the San Francisco landscape. 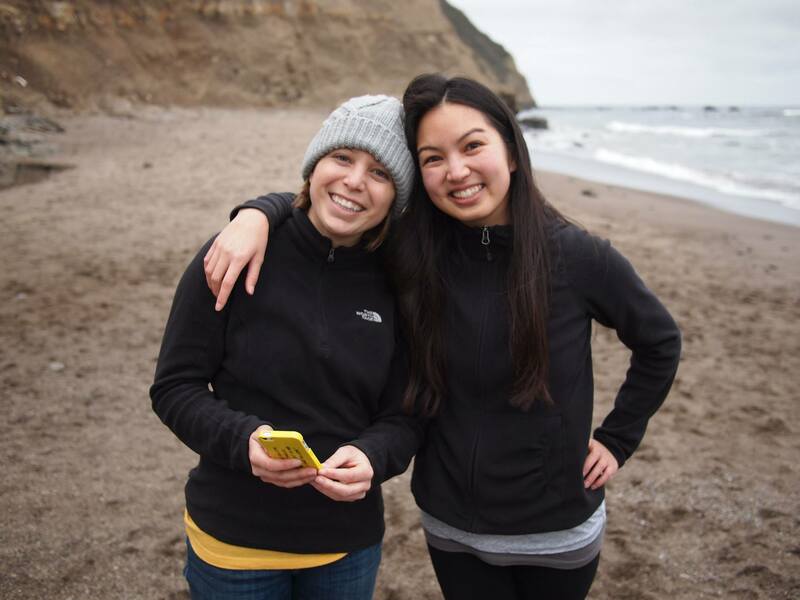 Unlike Baker Beach, which can be bustling and busy, Marshall Beach provides a quieter, more contemplative atmosphere where you can really soak the the dramatic, rugged coastlines. 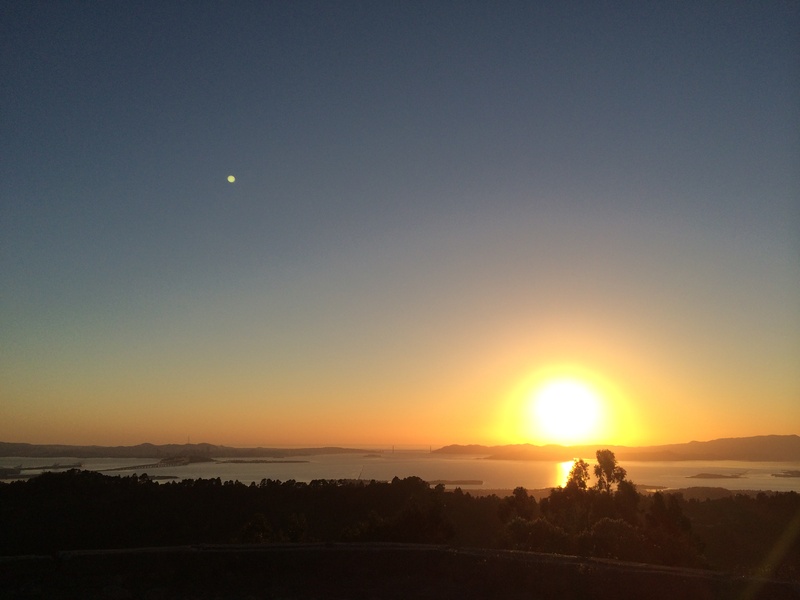 From there, we headed back to our starting point, making the little trip a quick, 4.5 mile, out-and-back hike and a great start to what was soon to be a warm San Francisco summer! I know I’m behind by two weekends/hikes, but I had to document this past weekend’s first — it was fantastic! 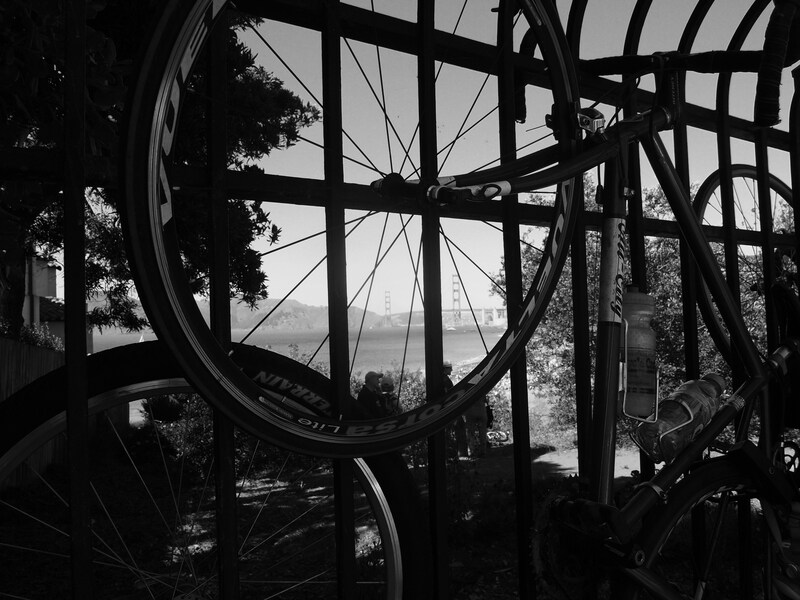 After attending college in the Bay Area for four years and living as a (sort of) functioning adult here for two and a half years, I had never been to Angel Island. Why did I wait so long to visit? 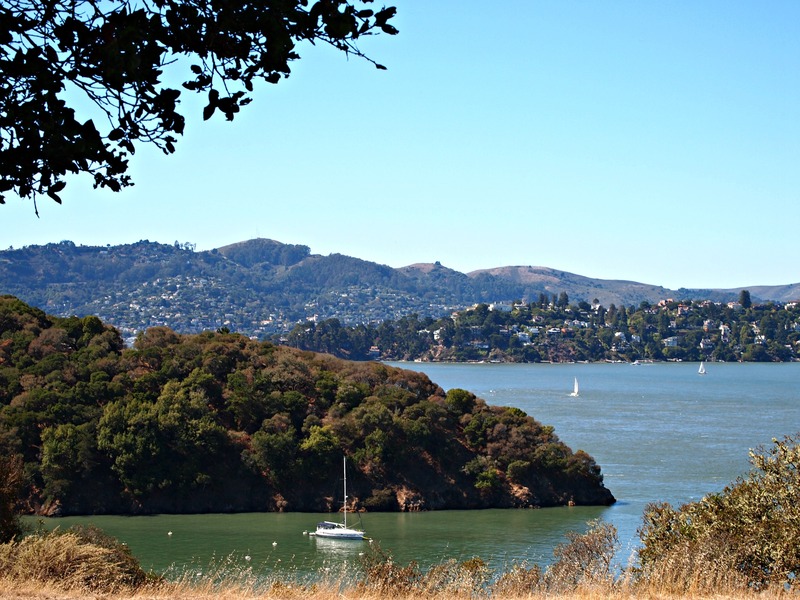 If you get the chance, don’t follow my footsteps — visit Angel Island as soon as you can because it is a fabulous little retreat with lots to do and fantastic, 360 degree views of the bay on a clear day. 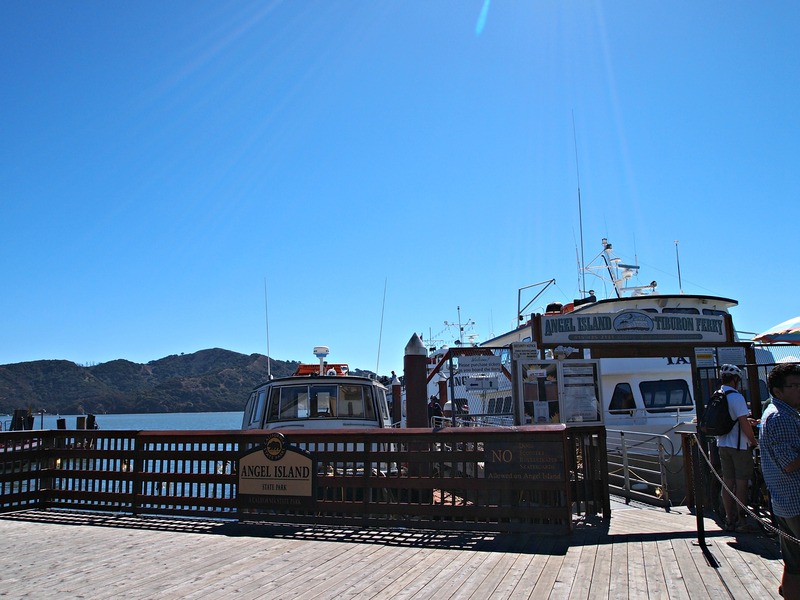 Angel Island is also sometimes thought of as the Ellis Island of the West Coast, so to speak, so there is a wealth of history, especially immigration history, to be found on the island. To get to Angel Island, half of us took the ferry from Tiburon while the other half hailed from the San Francisco ferry. The round trip ticket from Tiburon costs $13.50, and the ferry ride lasted all of ten minutes. Quick and easy and free of sea-sickness. Paul was MIA this trip, so this post’s photos are my own unless otherwise noted. (Paul seriously missed out! Sorry, Paul, we’ll go again soon!). James, Sarah, Jarrett and I are ready to board the ferry from Tiburon. 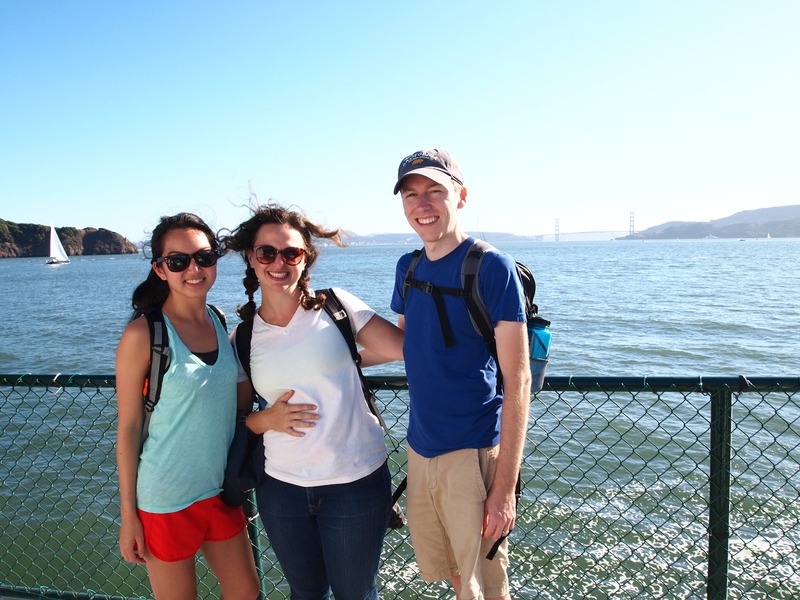 We rode in the back of the ferry and caught some amazing views of the GGB (that’s the Golden Gate Bridge!). 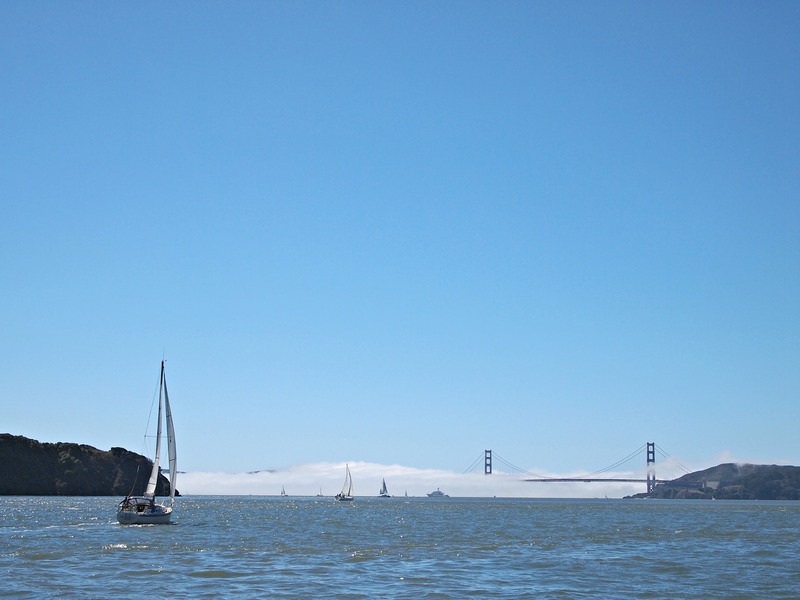 On such a clear day, sailboats were out in full force, creating a truly idyllic scene on the Bay. 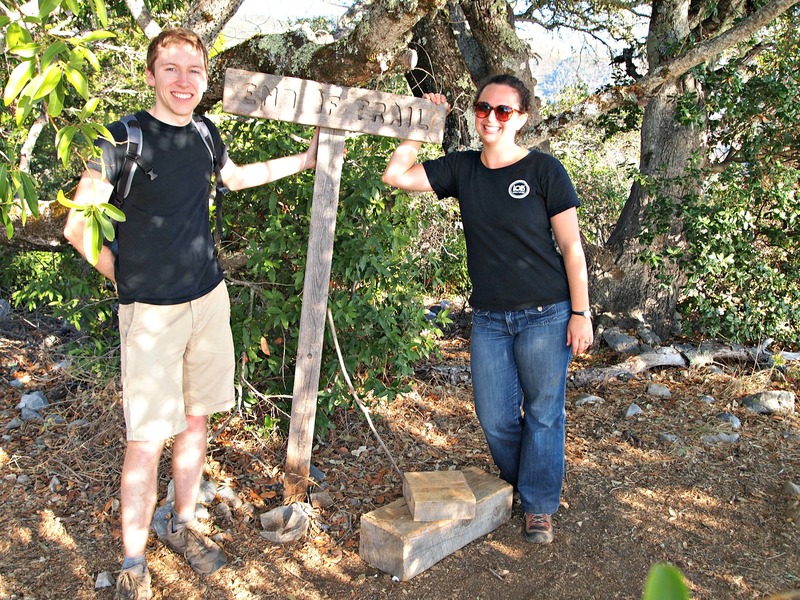 In researching which trails to traverse, we were recommended the five-mile Perimeter Loop, which circles the island; however, Sarah and James have a great book of Bay Area hikes (101 Great Hikes of the San Francisco Bay Area) that led us to choose the North Ridge Trail instead. What a fantastic decision! 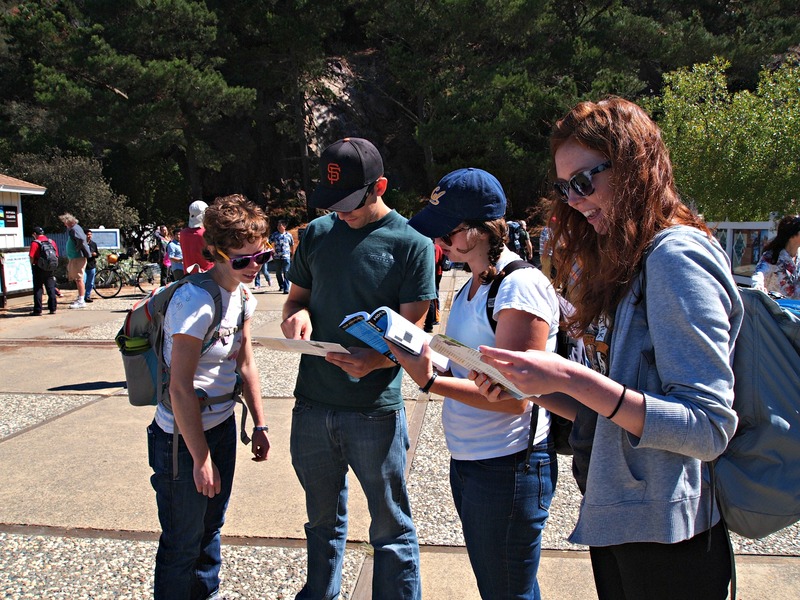 Hikers debating between the Perimeter Trail and the North Ridge Trail. 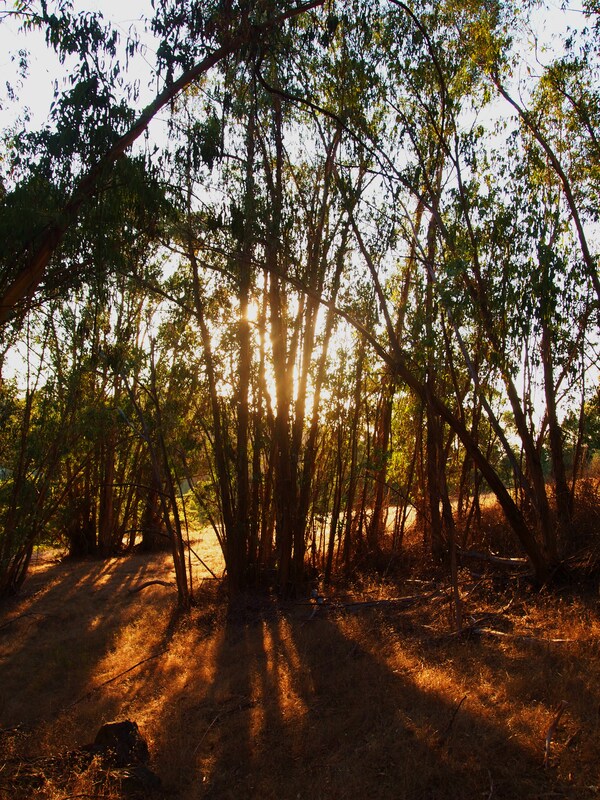 The Perimeter Trail seems better suited for bicyclists and families with strollers, as it is almost entirely paved. We picked the North Ridge Trail because it is unpaved, has no bicyclists, fewer hikers, and reaches the summit of Mt. Livermore, the highest peak on the island. The trail begins with a quick ascent up a set of stairs (about 150 steps?) then pretty much flattens out for the most part for the remainder of the hike. It crosses varied terrain, which keeps things interesting. 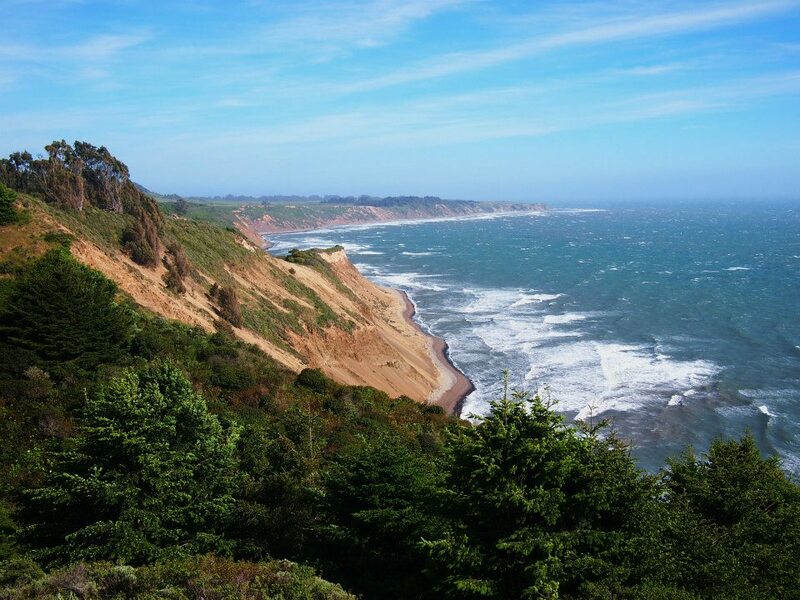 You’ll hike through shady, cool wooded areas, grassy, sun-filled landscapes, and coastal cliffs with fabulous ocean views. I swear, rounding every corner, there’s an even better vista than the last spot. A few scenic shots from the hike up that showcase the trail’s scenic variety. 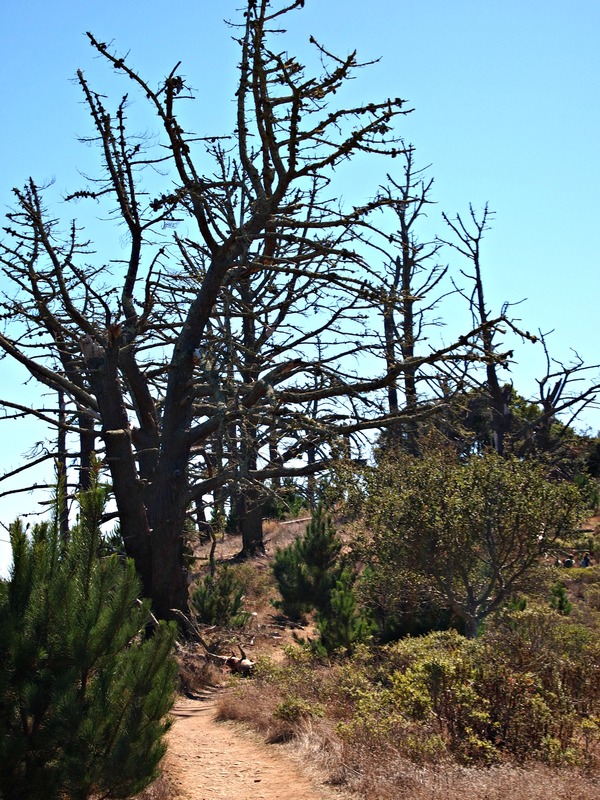 The third photo includes some recovering trees, the result of the 2008 fire that damaged nearly half of the island. Group shot! Pictured in the background: San Francisco (to the right) and the new Bay Bridge, though you can most clearly see the half that wasn’t recently updated. A few yards below Mt. 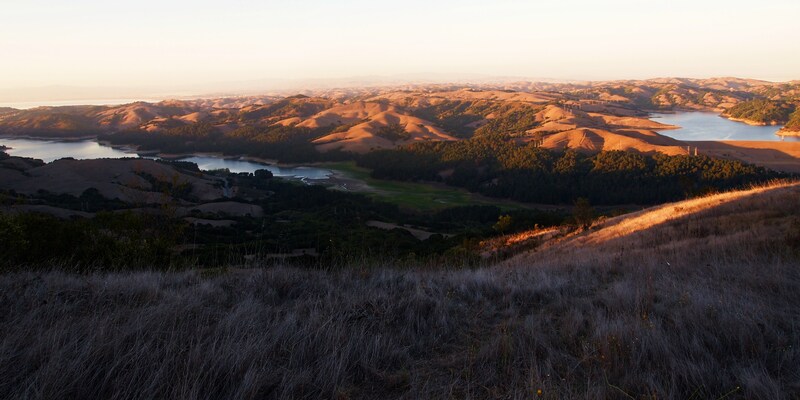 Livermore’s peak, a few well-placed picnic tables offer great views of their own. We spent some time at the peak watching the Kiwis and the US battle it out during the America’s Cup with a perfect backdrop that included the GGB. You couldn’t ask for a better view! After the race, we headed down a few yards to the tables for lunch where we were all introduced by Jarrett to Cookie Butter from Trader Joe’s. Personally, the jury’s still on out on this one for me, though everyone seems to be kooky for it (corny pun definitely intended). Lunchtime view near Mt. Livermore’s peak with Tiburon in the background. Fact: Did you know the peak of Mt. Livermore is semi-artificial? In the 1950’s the US Army shaved off the top of the peak to facilitate the placement of the Nike Missile Site; however, the dirt was never discarded — just thrown down the hillside. In 2002, the peak was artificially recreated using the original dirt and native shrubbery. After lunch and the great Cookie Butter debate, we began the quick descent back to the ferry landing. 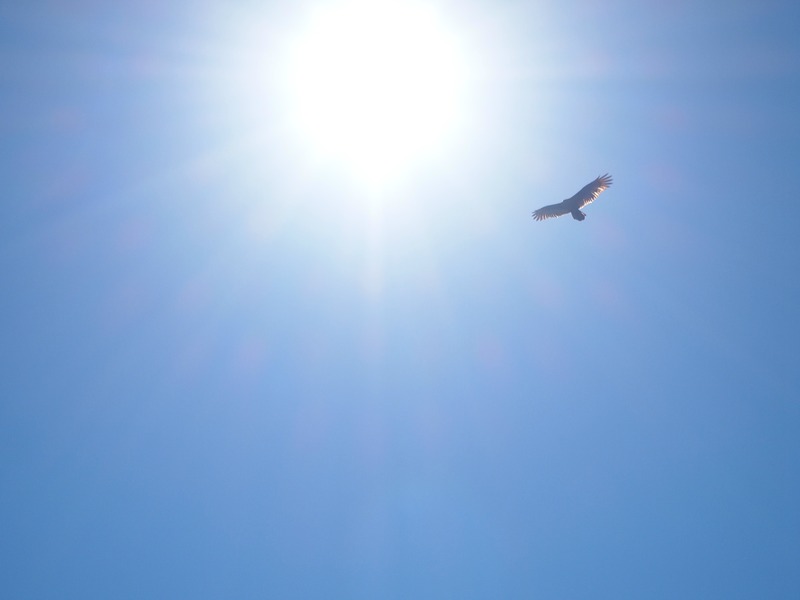 We spotted a few deer and this majestic hawk throughout the hike. Our descent included a break on this bench to enjoy the view. This pose was purported (by Lisa, photographed by Sarah) to be quite comfortable. What do you think? After our super-sunny, super-scenic hike, we waited to catch the ferry back, enjoyed some live music drifting through the breeze from the little restaurant Cantina, and Irene and Chris devoured a well-deserved It’s-It, the San Francisco treat. Yep, Rice-a-Roni was wrong, it’s all about the It’s-Its. If you’re unsure what an It’s-It is, let me explain. This delectable goody consists of ice cream — vanilla, mint, chocolate, or cappuccino — sandwiched between two scrumptious oatmeal cookies all dipped in dark chocolate. It truly is the San Francisco treat — yum! Tuckered out trio heading back to Tiburon. Not photographed: our seal and dolphin friends. 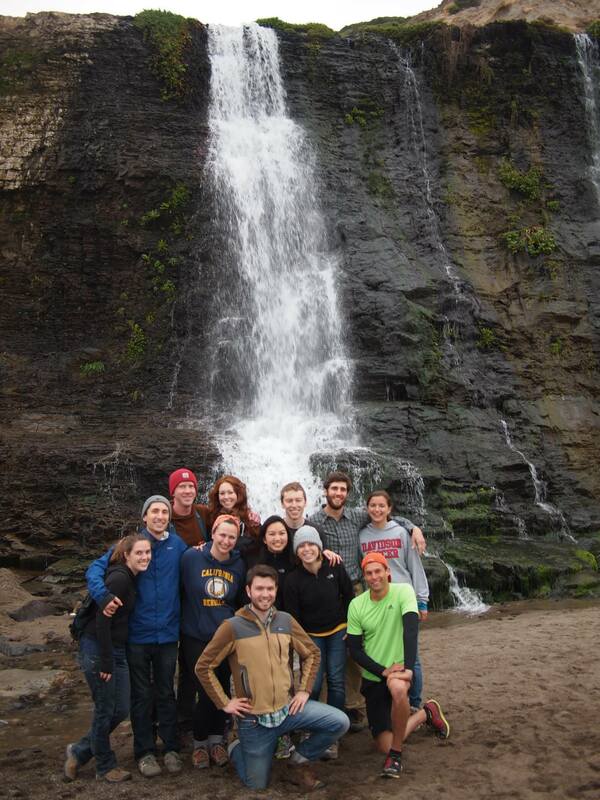 Conclusion: This was one of the best hikes we’ve accomplished! We traveled by boat, soaked in some epic views, and surveyed an America’s Cup race from a mountain top all in the best company — couldn’t ask for a better Sunday afternoon!